I get so excited when I have a reason to find some fun plates and to design a tablescape. When I saw these darling plates at Tuesday Morning I had to buy them. We have two hummingbird feeders outside our window and it is such a joy to watch the birds fly up to the feeder and drink the sugar water. We have lots of hummingbirds in our garden too. I do question the placement of the hummingbirds. One upside down is interesting. Oh Betty this is GORGEOUS! Those hummingbird plates are "To Die For"!!! LOVE,LOVE,LOVE those little birds! Hmmmm, I think I need some plates with them on it! I also love your details(all of them), the twig wreaths raising the plates is PERFECT!!! HAHAHA, I agree on making the wreaths. I can picture your attempt though! Thank you for the ideas "AND" a few new things on my wishlist! 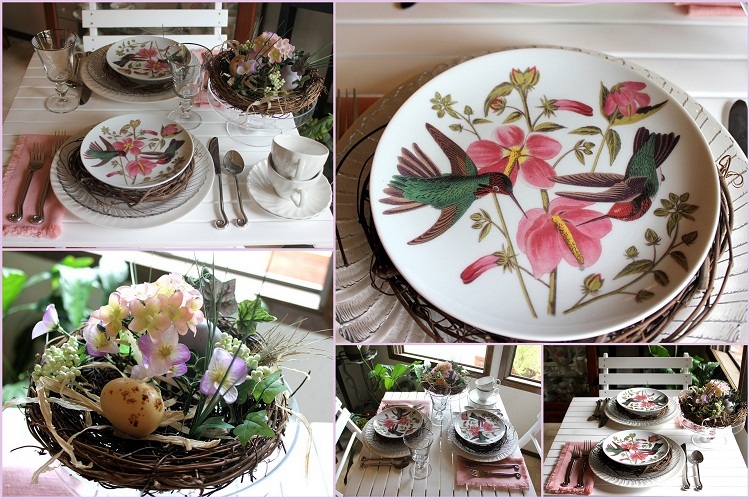 Your table is sweet with the hummingbird china. I love the twig wreaths beneath the plates and the 'nest' you created! Thanks for sharing and enjoy the rest of your week. Those plates are so lovely. I love Hummingbirds and we too have so many. They dive bomb each other at the feeder. I have a pair of humming bird salt and pepper shakers, but I dont use them as I'm afraid the beak will get broken. These are very nice..
have a great Holiday weekend..
What a lovely table setting and plates! Beautiful post here! Thank you for linking to Tea in the Garden! Hi Betty, Love your sweet hummingbird plates. Great flatware too. What a pretty tablescape! How lucky you were to find the hummingbird plates. Your tea setting is so pretty. It is so much fun to set a pretty table! We don't have a Tuesday Morning where I live, but when travelling I love to stop there! Have a good evening. Oh, I love your hummingbird plates. I photograph hummmingbirds a lot around here and they never cease to amaze me. Such a pretty table. I love your flatware too. Have a happy weekend! Oh my gosh I love those hummingbird dishes! A lovely tablescape, and I adore the humming birds. That one isn't actually upside down - it's got its wings above its head, and its head dipped down - they do go into the most amazing contortions. Fabulous collection of plates, love them.